'Empractical' speech occurs when humans converse occasionally during non-verbal activities such as fishing. 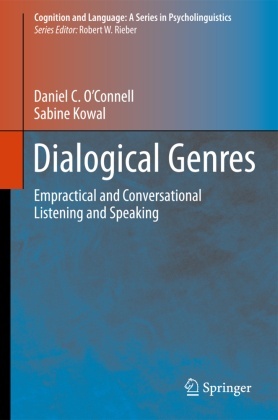 This volume combines historical, theoretical, and empirical approaches to delineate the differences between empractical and conversational speech. This work gives a thorough revision of history through a psychological approach to verbal interaction between listeners and speakers. This book offers a large amount of information on the psychology of language and on psycholinguistics, and focuses on a new direction for a psychology of verbal communication. Empirical research includes media interviews, public speeches, and dramatic performances. Part I: Taxonomoy and selectivity.- Historical sources: Credit where credit is due.- An historical search for genres of spoken dialogue.- An empirical search for genres of spoken dialogue.- Part II: Theoretical considerations of empractical speech.- Empractical speech: The forgotten sibling in spoken dialogue.- Time - Arbiter of continuity.- Listener roles in genres of spoken dialogue.- Social responsibility in spoken dialogue.- New directions.- Epilogue.